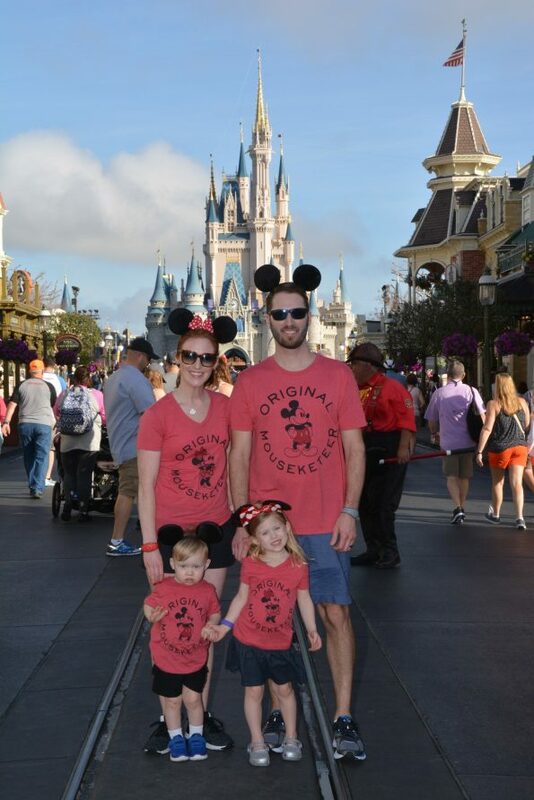 We are back from a truly magical week in DisneyWorld! We celebrated my daughter Lucy’s 4th birthday and had the best time meeting princesses and characters, going on rides, and just being together. I didn’t post anything on my social media while we were there so that I could just focus on my family. I didn’t want anything to take away from our memories together. Also, I was completely exhausted at the end of every day! My overall thoughts of food in DisneyWorld? Of course they are great with food allergies. 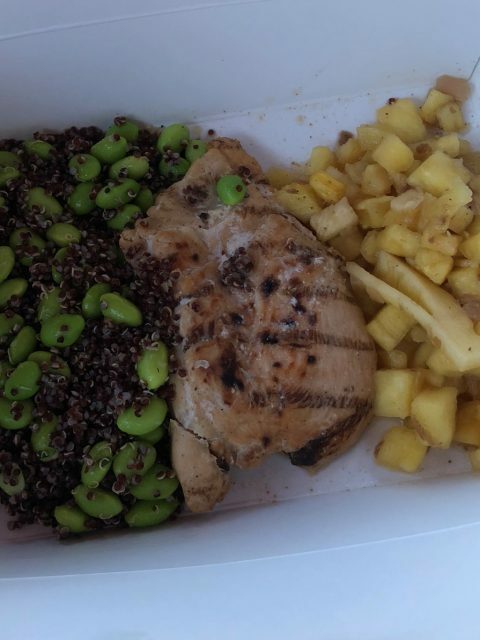 But in all honesty, I was kind of underwhelmed with the quality and variety of the gluten-free food. Am I a horrible person for saying that? I don’t know what I was expecting out of it. Maybe I was expecting to be fawned over and able to get whatever I wanted whenever I wanted, just like a normal person. 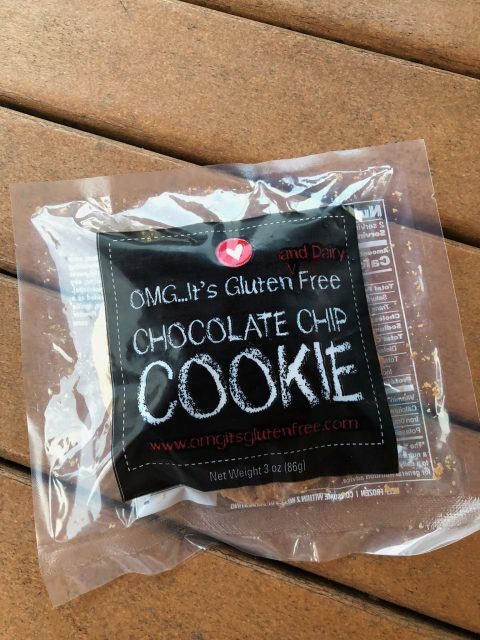 We definitely could have spent more time exploring and finding gluten-free foods if I didn’t have my kids with me (obviously!). But I did my best and I fed myself without getting sick so that really is the best thing! 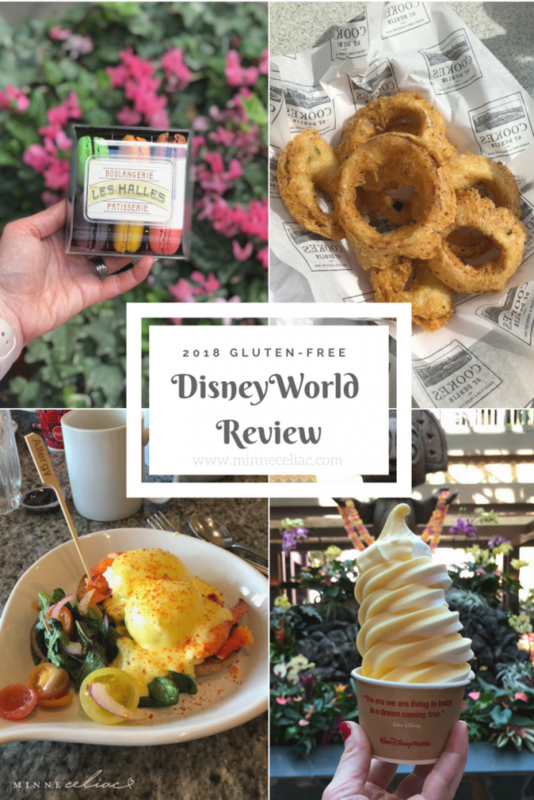 Here is my 2018 DisneyWorld gluten-free food tour, starting with our resort! You’ll also find links to separate blog posts for all the parks we visited! 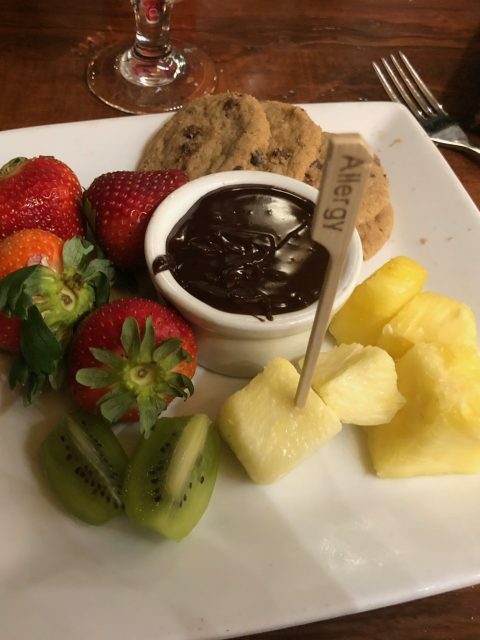 We stayed on property at the Polynesian Village Resort which has a good variety of restaurants with great gluten-free choices. They have a quick-service restaurant called Captain Cook’s which also includes some snack items and is open 24 hours. 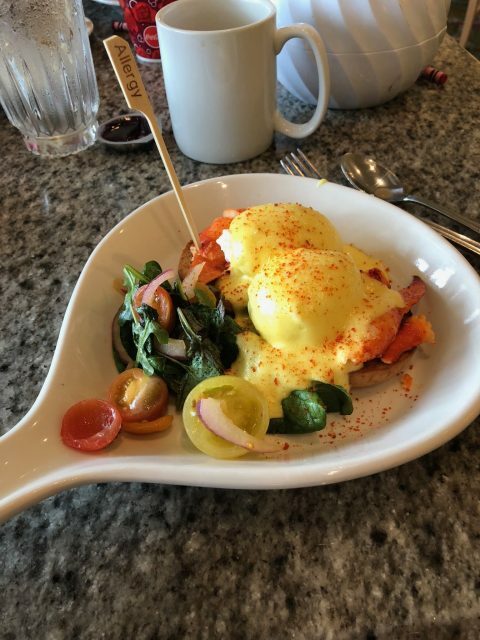 There is a full-service, sit down restaurant called Kona Cafe which serves breakfast, lunch, and dinner. 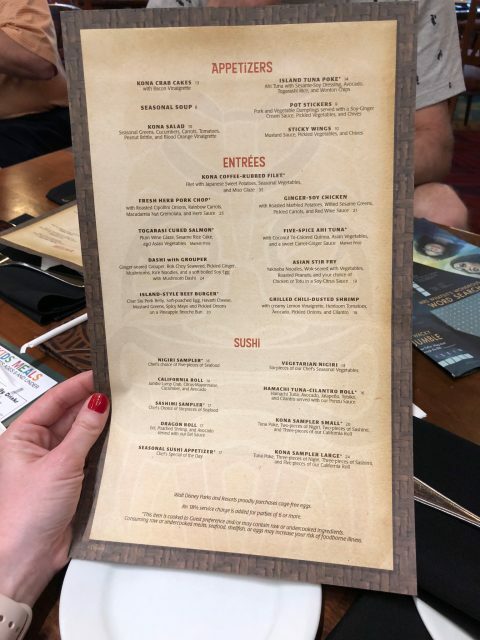 They also have a coffee/pastry/sushi bar and then they have Ohana which offers a full sit-down character breakfast and a dinner show. 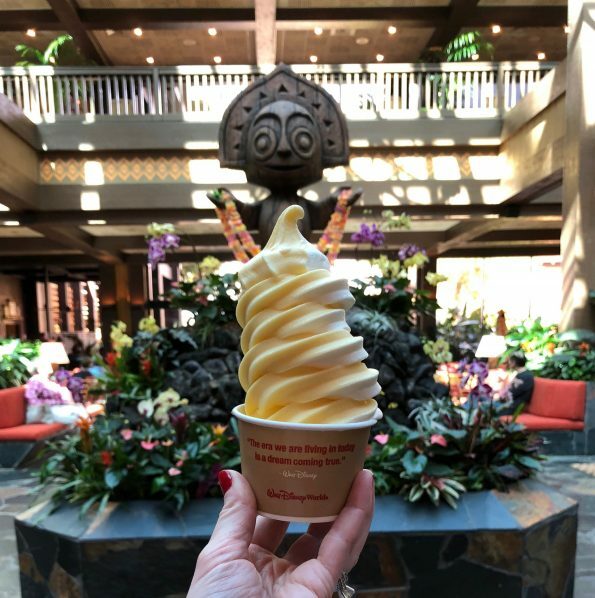 The Polynesian is also home to Pineapple Lanai which serves the delicious and highly sought out gluten and dairy-free Dole Whip! 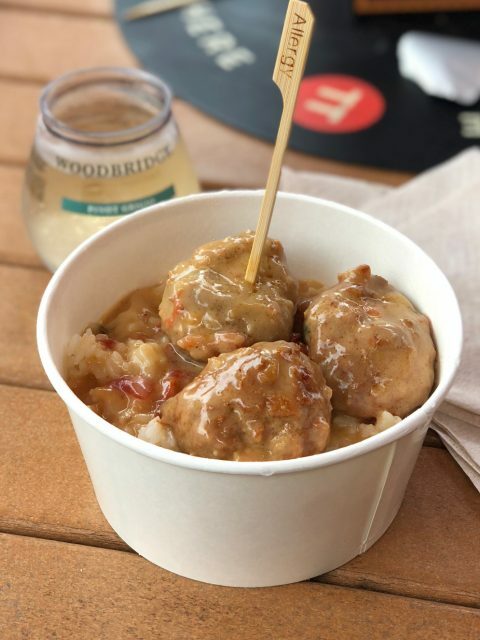 Captain Cook’s has hamburgers, chicken sandwiches, thai meatballs, a chicken breast with quinoa, and seafood curry as entrees for lunch/dinner. 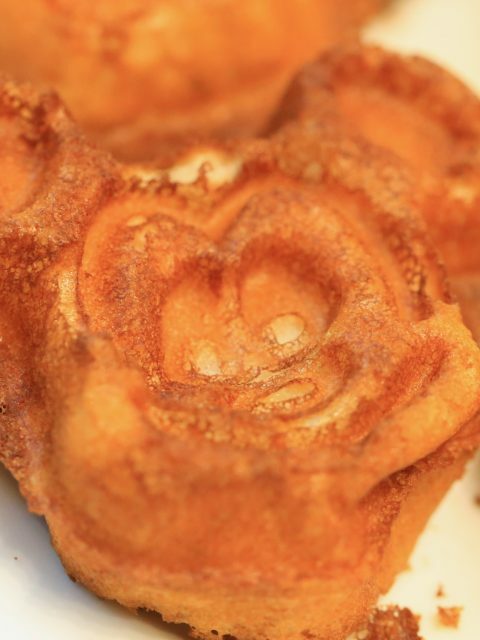 They also had the famous Mickey waffles available for breakfast here. They have a dedicated fryer for french fries and a pre-packaged brownie or cookie or mickey ice cream bar for dessert options for us. Everything that was on the allergy menu came out with a special allergy stick (which we love) and packaged in to-go boxes, never on a plate. That showed me they took precautions to avoid cross-contamination. Our last night there we went back to Kona Cafe for dinner. They had just started a brand-new dinner menu since I was there earlier in the week. 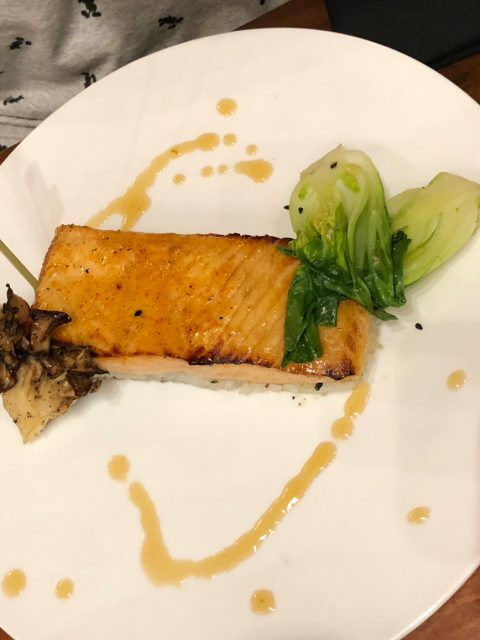 The chef came out to talk with me and said that most of the items on that menu were gluten-free to begin with but went over my options. 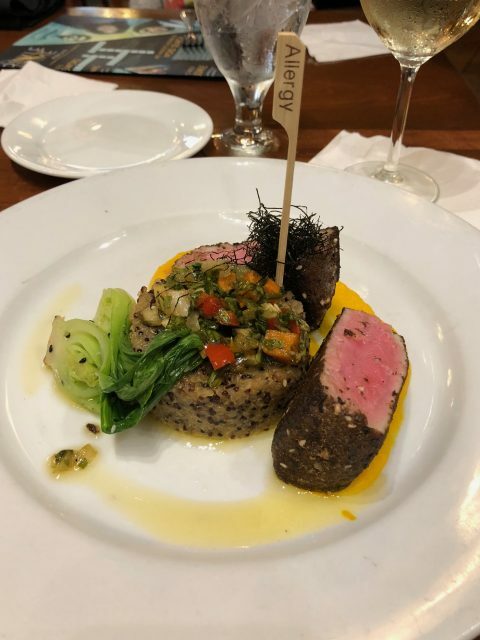 I ordered the ahi tuna and Brian ordered the salmon. Both were delish! 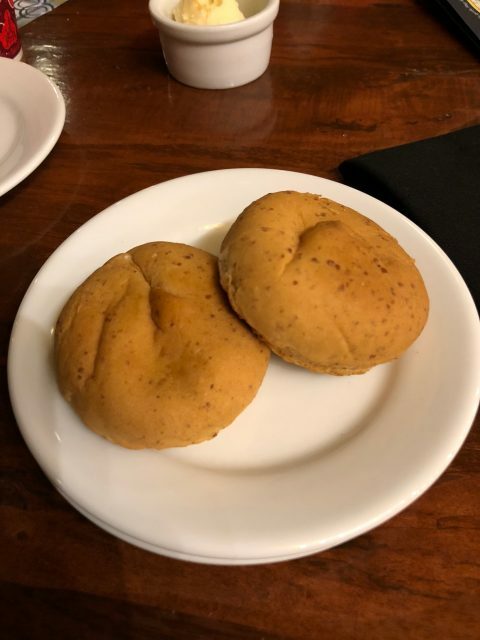 This night they brought out macadamia nut honey butter to go with my gluten-free rolls. For dessert, I ordered the coconut tapioca pudding and it was pure heaven!! And finally, let’s not forget about good ol’ Dole Whip! 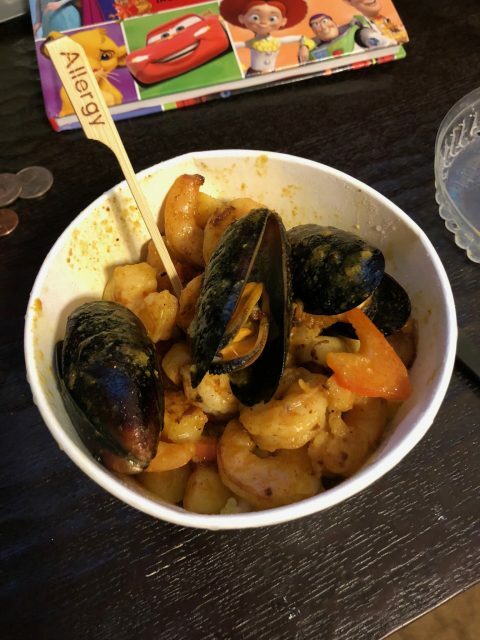 I told myself that I was going to indulge and have it every day because it was so accessible and a snack on our dining plan, but I ended up eating too much most days and only got it two times! My personal favorite was the dole whip/ice cream twist combination, no cone of course. FYI, there is also a Dole Whip stand in Magic Kingdom. 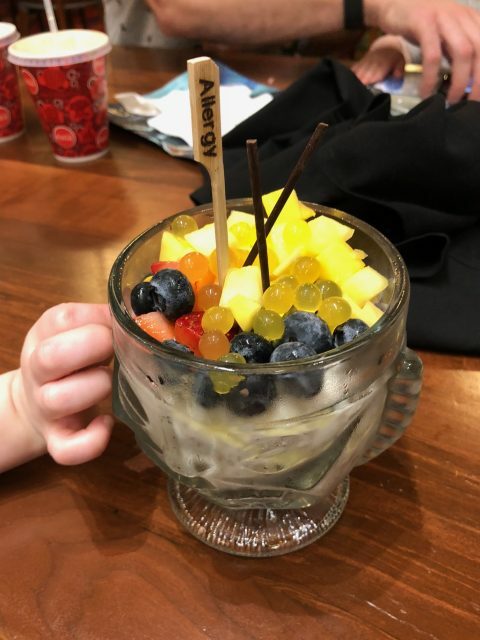 It didn’t fit into our schedule this trip to go to Ohana, but I’d love to go there next time! 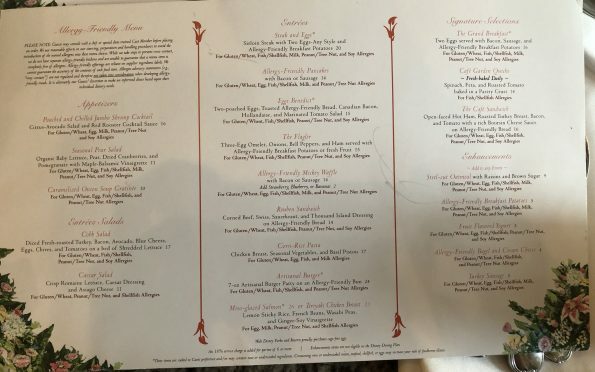 We also visited the Grand Floridian Resort Cafe for breakfast one day. Our hotel and this hotel are neighbors on the monorail line so it was easy to get over there. 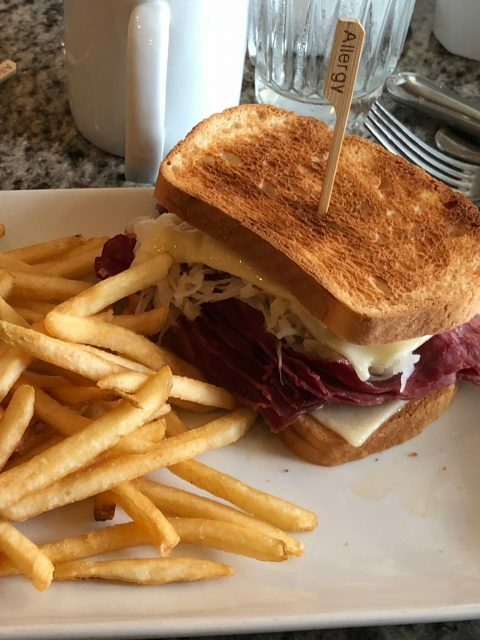 They had great gluten-free offerings and they serve lunch all day so my husband ordered the reuben sandwich with french fries and I had the lobster eggs benedict. 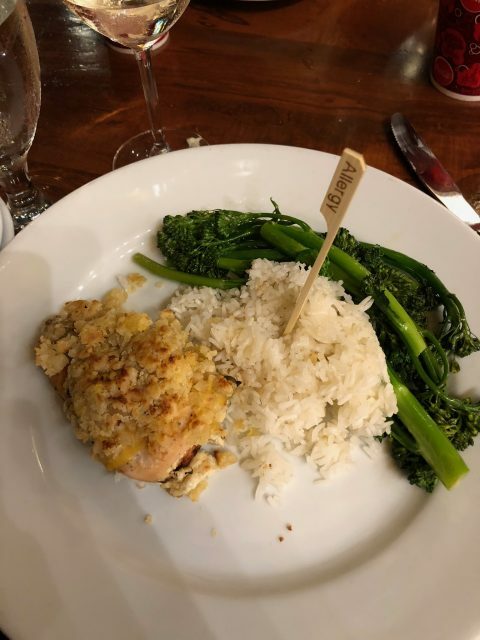 Really good choices and great service! 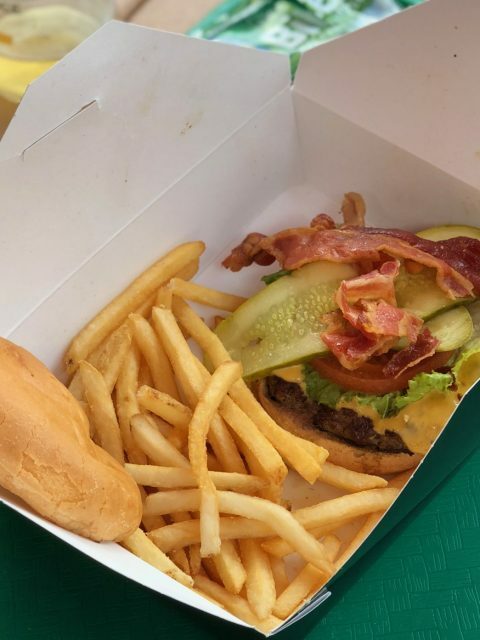 Are there any other tips, outside of the food, that we have after experiencing Disney? Yes! However long you think you’re going to need to get somewhere, add a half hour. Always. Especially with kids. You never know if you’ll have to wait for buses, if there will be long lines to get in the parks, and how long it will take to walk to your destination once you get in the park. Just always add extra time. Traveling is a big part of getting around in Disney. You can totally get away with wearing a Disney t-shirt and Mickey ears every single day. Everyone else is doing it and you won’t look stupid. That’s all part of the fun, right?! If you have temperamental hair like me, then be prepared to wear it in a ponytail each day. And just wear tennis shoes and t-shirts. I’m warning you ahead of time, you’ll be doing a ton of walking so go for comfort. Bring your stroller along (or rent one there). So much walking. Everyone will get tired, even the big kids. We actually bought a little device called a Tile that we hooked up to our stroller in case we couldn’t find it amongst the million other strollers there. Good thing we did, because we lost our stroller one day after it was moved by someone. And even though Brian had the Tile it still took us quite a while to find it. I don’t know how we would have found it otherwise! Moms – consider a fanny pack. They’re back in style now. I had a backpack with me that I threw under our stroller, but wish I had something to keep close by me for easy access to my phone or lip gloss or sunglasses. For little girls that like to wear princess dresses I would recommend dressing the girls in something comfortable and bringing the princess dress along to change into later. We didn’t go during a “hot” time (I cannot imagine being there in the summer), but it was still super humid and warm so I’m glad Lucy had some t-shirts and shorts on. She just did quick changes throughout the day if we were meeting princesses or something. We made the majority of our dining reservations when we were there. I think we only made one ahead of time. 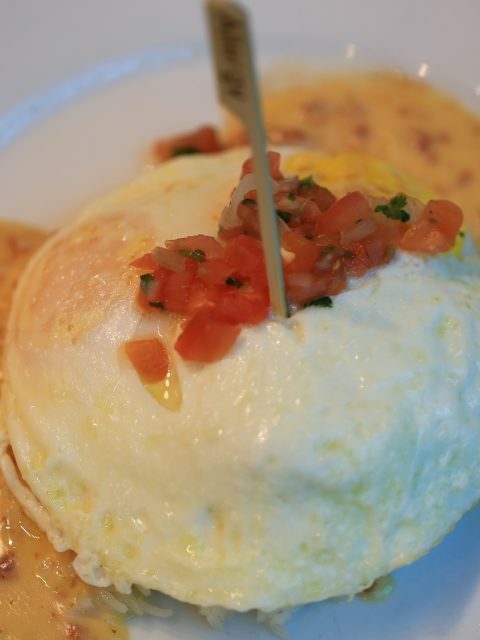 Don’t stress too much about getting or not getting a reservation prior to your trip. I heard that lots of people overbook their reservations and then cancel when they are there. That means we found openings at some great places just by searching the app every day. Get the Memory Maker. Absolutely, 100% worth it to have someone else take nice photos for you. We got so many great memories out of it! Seriously, this was one of the best weeks of my life. Seeing all of the excitement through my kids’ eyes is something I feel so lucky to experience. We can’t wait to go back to Disney again!